The Tengu is a fascinating creature, neither black nor white, it seems to permanently reside in the area of grey (pun not intended). Ours wasn’t a temple that many people frequented, if you didn’t count the occasional onslaught of neighbor kids using this place for kimodameshi – a game of courage. The path towards the Kanda temple wasn’t marked with a torii gate but we did have a delightful flight of 333 stone steps to climb up. I had been trekking up those steps since I could remember, with only the small forest that surrounded our temple to distract me. Sometimes I wondered if the Kanda temple was placed up here for a tactical reason. Even on temple-dense holidays like New Years or before the exam period, the patronage wouldn’t be all that high. Only the very faithful and those in trouble knew to find us. Midway up, I felt a blast of wind hit me in the face, stinging but not exactly malicious. It was the signature precursor of Gosenbo-san. He appeared before me in a swirl of a small, controlled whirlwind. Tengu’s liked to make dramatic entrances. “You stink of human,” was his cheerful greeting. I hitched up my bag, not liking where this was going. “But you’re thinking about it. Thinking is a dangerous thing for humans.” His voice was soft and quiet. I would have preferred the yelling. “Screw duty! I’ve been hearing it from everyone: you have a duty to this, a responsibility to that – I’m only fifteen! I want to know about something other than ten thousand ways to kill youkai, I want a life.” To be honest, I wasn’t sure what I meant by having a life. I’d never actually had one outside of my family. I only knew youkai, and there was a real possibility that I’d never find it, but I was on the defensive. Gosenbo-san stared me down; his long red nose was like an accusing finger. That sickeningly familiar feeling of shame mixed with guilt curled up my spine, no matter how much I tried to beat it down. This Tengu wasn’t really my family, I didn’t have any real obligation to him, so he didn’t have the right to use family guilt on me, but it didn’t stop the feeling from spreading. “Then you may want to consider this first,” He said. “Your grandmother gave her life to protect her descendants. She died an Onmyouji. And she was proud of the title, of herself as one. She would want her children, her grandchildren, to feel the same pride in something that the Heavens gave her. Something greater than any human could even think to accomplish, something people would do not to throw away at the slightest provocation.” He disappeared as suddenly as he came, leaving only the slap of a dried leaf against my skin. “I’m not my grandmother.” I whispered into the empty air. We broke off when we reached the steps that led up to Mitsuo’s shrine marked by the torii gate– two upright wooden posts painted red with two cross-pieces at the top. All shrines, especially the major ones were marked off from the city by a long path. The Masuda and the Kanda family had a long and complicated history. 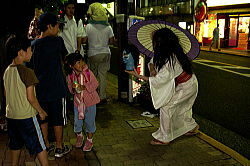 Centuries ago, the two families had been partners, colleagues in that same field of dispelling youkai. Because of the tour, Mitsuo and I were walked home later than usual and the sun was starting to set. Dusk was the time a youkai’s day started. Darkness was their friend. Cue creepy organ music.